Thanks to the folks at tinyBuild our LoreHound crew got a chance to try out SpeedRunners for the first time at Pax South 2016. Prior to PAX South, I personally played it either on my own spare time or locally with friends. 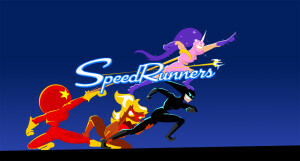 To summarize the game’s quality: Speedrunners is an addictive combination of easy to pick-up controls and fast, competitive, play. It relies heavily on your ability to quickly react to changing situations – such as your position in the race, the power-up you have, other power-ups players have – and your ability to memorize new maps, making note of item/obstacle locations so that you can utilize them on the next go around. On top of that, after enough time or after one of the players gets knocked off the screen, the ante quickens as the screen itself begins to close in on the players. There is actually a bit of backstory, though obviously not the main focus. Essentially every character is a colorful superhero residing in a city FULL of superheroes. With so much competition in the city it’s a “race” to get to fight crime. All characters play the same, no special abilities or anything, but each have their own fantastic animations and running styles, my personal favorite being Cosmonaut Comrade; a Russian dressed up as a space-faring Cosmonaut, rocketing (as per his jump animation) past the competition. They also provide nods to other great indie games, allowing you to use skins like Gang Beast, Octodad, Twitch, etc. DoubleDutch Games has created a gem of a game definitely a must buy if you or your friends like couch play co-op games. It’s still in Early-Access, but it’s as polished as a finished product. 14.99$ is definitely on the upper-end of this type of genre, but it’s well worth it in my opinion. Getting together with the LoreHound Crew to try it out “officially”, though, really brought me to the next part of the conversation. It’s pretty apparent now, for those that don’t even follow games too much that the PC Gaming market is providing for more interesting couch-play games; I wouldn’t say the PC gaming market as a whole is shifting by any means, but Couch-Gaming has grown QUICKLY. Steam predicted the growth and came out with both Steam-Link and Steam-Controllers (I insofar own the latter and very much want the former); perhaps I’ll write up a review. Some people loathe this progression of PC Games adopting “console”-esque features and games, but personally I find the move refreshing. A return to the roots of gaming, where you didn’t really play online and the only way to share gaming experiences was right next to each other (otherwise it was all word of mouth). I love online co-op games, and will continue to play them, but when everyone gets together on a Saturday night – usually after our Friday night tabletop sessions – to play local co-op games there really is nothing else that amounts to as much fun. I’ve dropped at least 200$ on games in this genre, the best and most notable being Speedrunners, Hammerwatch, and Gang Beast(!!! ); sadly for my wallet there is no sign of slowing down. The crew did get together to talk about this phenomena and how each of us feel about it, as well as a discussion about SpeedRunners in general, so keep an eye out for that video on our YouTube Channel (while also checking out our other PAX South 2016 videos)!